Whether we think we can’t, or think we can: That is what we will do. It is true. From the abundance of the heart, we speak. While the words big, good, and gold are subject to the foibles of semantics, the ‘ould words are definitive in their usage and meaning. When we hear them, a judgment is being made. The words are: Could, Should, and Would. Less egregious, although just as damaging, is when the ‘ould words are used by us against ourselves. As Pogo acknowledged, “I have seen the enemy and he is us.” In combination with “I could have …”, “I should have …”, and “I would have …”, listen for how many times the individual saying those things, also utters the little word “Try”. While the four-letter word “Can’t” is clear in communicating inaction, the three-letter word “Try” is sinister. At best it is misdirection and at worst it is manipulative. As proof to this premise, do this exercise with me. Take a pen into your hand. Now, stretch your arm straight out, parallel with the floor, and “try” to drop the pen. One of two things will happen: You will either hold onto the pen — or, you will drop it. No try to it. It is a matter of will. You either don’t — or, you do. The final — and, only legitimate — usage of the ‘ould words is when we’re communicating the contrast of our frailties to the mysteries of Providence. Would have come their way. While the temptation is strong to find all the reasons why we couldn’t, shouldn’t, or wouldn’t do something, there really is no excuse. Ours is not to judge — ours is to do. 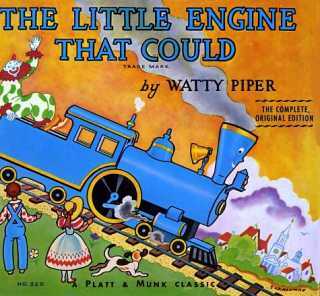 My favorite childhood book was The Little Engine That Could. It is a story about optimism and hard work. The underlying theme is of a stranded train that is unable to find an engine willing to take it over a mountain to its destination. Only the little blue engine is willing. While repeating the mantra “I think I can, I think I can …”, it overcomes a seemingly impossible task. Whether we think we can’t — or, think we can — that is what we will do. All We Do Begins With A Thought.